Bill Works Great "I bought this over a month ago and glad I did." 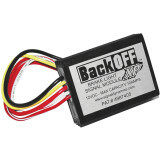 Moto - Texas Great product "I put this on my 06 Ninja 650R and love it. Comes with good instructions, but if you aren’t that familiar with wiring, I would watch a couple of you tube videos first. It only requires cutting one wire on the bike (the one that makes the brake light brighter when the brakes are applied; I recommend doing this on the final wiring harness by the brake light so that either brake will activate the module)."